Voter turnout was 75% in Zimbabwe's first general election since long-serving ruler Robert Mugabe was ousted, officials say. Polls have closed and counting is now under way. It is expected to be a tight contest between the incumbent Emmerson Mnangagwa and his main rival, Nelson Chamisa. The official result is due within five days. A run-off election will be held on 8 September should none of the 23 candidates win more than 50% of the votes. Parliamentary and local elections were also taking place on Monday. Polls officially shut at 17:00 GMT but some remained open to allow people already in queues to vote. Opinion polls gave Mr Mnangagwa, who heads the ruling Zanu-PF party, a narrow lead over Mr Chamisa, the candidate of the opposition MDC Alliance. Both leaders are running for the presidency for the first time. On Sunday, Mr Mugabe, who first came to power after independence in 1980, said he would not vote for his successor. Mr Mugabe, regarded as one of the last "Big Men" of African politics, was forced out of office last November by Mr Mnangagwa with the help of the military. 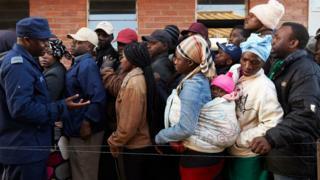 In Domboshawa village, about an hour's car drive from the capital, Harare, many had been in the queue even before sunrise. The first group of voters were mainly elderly people but there were some youngsters too. Surrounded by mountains and rolling hills, the villagers were in good spirits, chatting and laughing, as they waited to vote in a primary school that had been converted into a polling station. Media captionWhat do voters in rural Zimbabwe want? Having covered the 2008 and 2013 election, I met families who shared horrid stories of assault and intimidation for pledging allegiance to any party other than Zanu-PF. But there is an air of optimism about this election. "This election is different, there hasn't been violence. It's a good sign," one voter told me. How were candidates received at polling stations? 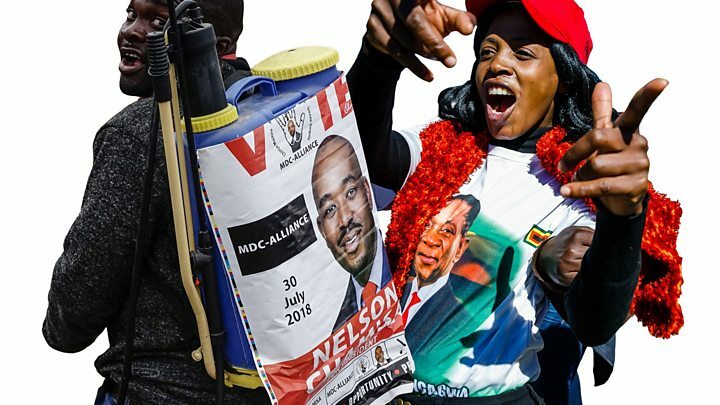 Crowds whistled and broke into chants of "Chamisa" when the 40-year-old MDC leader cast his ballot on the outskirts of Harare, amidst a media scrum. "We will win this election to the extent it's free and fair... it's a done deal," he told the BBC. He later alleged on Twitter that long queues in Harare suggested a "deliberate attempt to suppress and frustrate the urban vote". At one stage, he was seen taking his head out of the voting booth to check where he should put his cross on the ballot. After the polls closed, he tweeted that Zimbabweans had "voted in the spirit of tolerance, mutual respect and peace". He urged citizens to be patient and wait for the official result to be declared. How important are younger voters? The country expected a high turnout of first-time voters. More than 5.6 million Zimbabweans were registered, almost half of those under the age of 35. People had to re-register for this year's poll as the electoral commission introduced a biometric system to eliminate any "ghost voters" - though the opposition still alleges there are irregularities in the voters' roll. The Zimbabwe Election Commission (Zec) says it will deliver a credible poll. Hundreds of international observers were deployed for the first time in 16 years to ensure the vote went smoothly. European Union (EU) chief observer Elmar Brok said it was too soon to make a judgement but voting had been "very smooth" in some areas, and "totally disorganised" in other areas, Reuters news agency reports. Liberia's former President Ellen Johnson Sirleaf, who was monitoring the poll on behalf of the US-based National Democratic Institute, told the BBC that the long queues showed Zimbabweans were enthusiastic about voting, without any kind of repression. Mr Mnangagwa invited the observers as part of his attempts to end Zimbabwe's isolation, and to secure investments to rebuild the shattered economy. Mr Mugabe had a poor relationship with Western powers, accusing them of undermining Zimbabwe's sovereignty and trying to topple him. Is Mr Mugabe a factor? 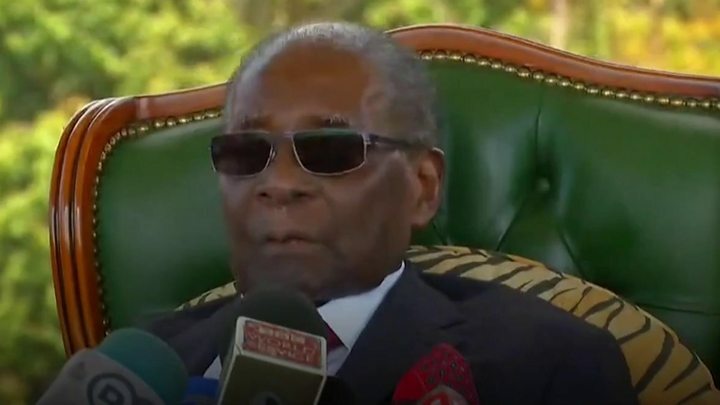 There is an overwhelming sense, especially among young people, that Mr Mugabe, 94, is out of touch, and a new Zimbabwe is waiting to be born, our correspondent says. 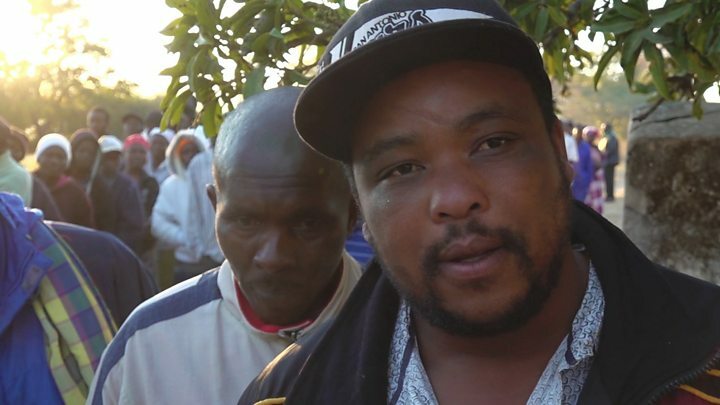 He voted with his wife Grace and daughter Bona in Highfield, a high-density township in Harare - the first time he will have voted for a presidential candidate other than himself. On Sunday, Mr Mugabe gave a surprise news conference where he refused to support his former ally Mr Mnangagwa, indicating Mr Chamisa was the only viable candidate. "I cannot vote for those who tormented me... I hope the choice of voting tomorrow will thrust away the military government and bring us back to constitutionality," Mr Mugabe said.